Hand woven Persian carpets have long been a quintesential Iranian gift. 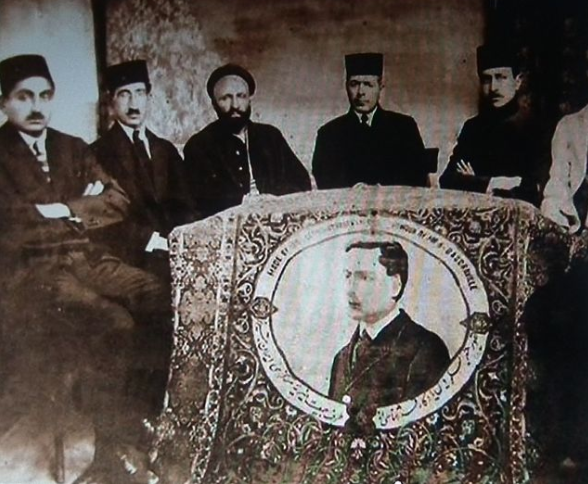 Some of these hand woven carpet gifts, like the one made by the Tabriz weavers with the picture of the American Howard Baskerville, have occupied a permanent place in Iran’s recent history. Howard Baskerville was an American teacher in the Presbyterian Missionary School in Tabriz , who was killed fighting alongside Iranian freedom fighters during Iran’s Constitutional Revolution in 1909. Tabriz weavers then made a carpet with Howard Baskerville’s face in recognition of his courage and sacrifice as a special gift to Baskerville’s mother. It looks like the hand woven silk carpet gift, given to the UN General Secretary, Ban Ki-Moon, by Ahamdinejad, will also occupy a place in the Iranian history, although for much less noble reasons as the one that was made for Howard Baskerville. 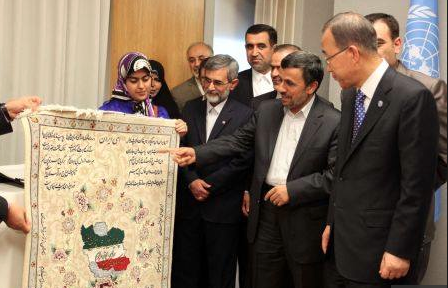 Ahmadinejad presented the carpet gift, shown in the above picture, to Ban Ki-Moon, three years ago. The carpet displayed a woven map of Iran with the words of the unofficial Iranian national anthem above it. Ahamdinejad presented this gift as “A symbol of Iran’s culture, civilisation, peace and friendship to the General Secretary of the United Nations”. Now, three years later, it turns out the carpet was never Ahmadinejad’s to give as a gift to anyone in the first place. The carpet belongs to an Iranian businessman, Asghar Taslimi, from Isfahan, who had left the piece with the National Iranian Carpet Centre as a demo sample, so he could get approval for a loan to mass produce that design. Taslimi was told to go back to Isfahan and someone would contact him with an answer, but no one ever did. His efforts to have his demo sample returned to him were to no avail either and he was passed from one department to another. Taslimi had given up on ever seeing his carpet again, until one day; his family phoned him and said they had just seen the sample he had left with the National Iranian Carpet Centre, on the state television news, being presented to Ban Ki-Moon by Ahmadinejad, in New York! The Iranian businessman swears he was never paid for the carpet nor did he ever give consent for his sample to be given to anyone as a present, and so technically the General Secretary of UN, Ban Ki-Moon is now in possession of stolen goods. Can't anyone sue the guy on behalf of the original owner? I've seen this sh-t before from Iranians. It seems to be a combination of them being disorganized, not respecting intellectual rights, not respecting property rights, and putting their politics over individual rights. Its really interesting how they pretend to have a mandate from God himself, while steeling other people's stuff and violating people's rights.